Carolynne Crawley, a child & youth worker, educator and holistic nutritionist, poses next to her portrait. Within a few hours, a community of Indigenous persons and ally-adjacent settlers came together around an opening reception to commemorate the launch of Photographers Without Borders’ (PWB) and Red Work’s joint exhibit, Indigenous Rising. The portrait series – photographed by Anishinaabe (Ojibwe) and founder of Red Works, Nadya Kwandibens – features indigenous artists, many of whom are scholars, media-makers, activists, and survivors, too. Their presence on these images and subsequently, throughout the storefront windows of many shops along Augusta and Kensington Avenue, challenges the misnomer of Canadian-indigenous identity – so much so, that the stereotypes regarding the Indigenous-Canadian legacy are overwritten by the bold, outward-facing display of these outstanding Indigenous citizens. Nadya Kwandibens is the founder of Red Works and the photogpraher behind the Indigenous Rising exhibit. The aim of this exhibition is to reclaim space – and to also create dialogue – through the open appraisal of the art being showcased. And even more so to that effect, Kwandibens’ hope is to spark interest. For people to recon with their shared history on what Aboriginal people truly experienced, they need to come in contact with the truth. Darlene Kanobi has been an Indigenous activist for much of her life and now holds a position for the Ontario Human Rights Commission. During the event held at the Pow Wow Café, some of the participants involved in the photo series were in attendance, and offered their own stories of resilience As people rallied around the voice of thought-provokers and leaders like Chief Stacey Laforme, the sound of drums performed by activist Crystal Sinclair, and the ceremonial use of smudge, knowledge keeper Laureen Bluewater couldn’t help but feel overwhelmed. "[Isn't it] beautiful that our drums and medicines are out in the open,” she said during her opening prayer. Crystal Sinclair, seen here with her hand drum, is an Indigenous Rights Activist with Idle No More Toronto, public speaker and artist. The sentiment was the same for Ian Campeau, one of the founding members of A Tribe Called Red and participant involved of the portrait series – announcing at one point how “incredibly empowering” it would be to see indigenous people on display for Indigenous people. 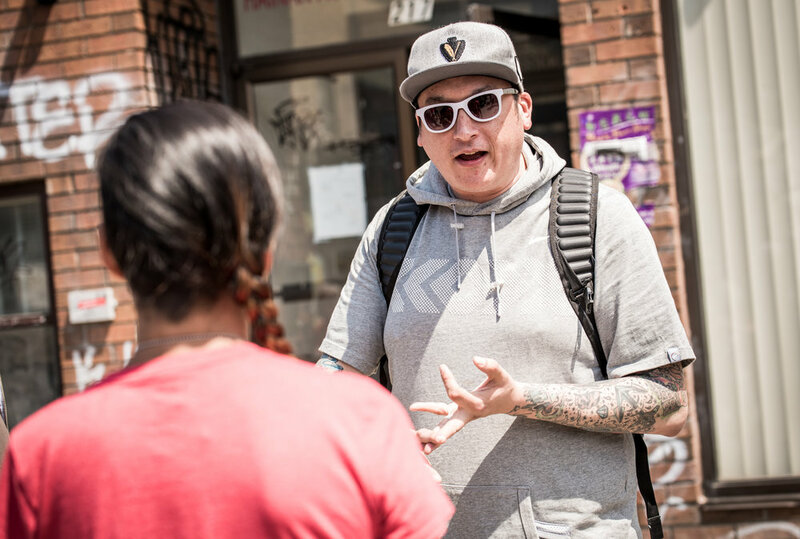 When asked about the mission moving forward, he said, with great humility, “If I’m getting recognized for what I’m doing, I feel like it’s [a] good trajectory,” referring in-length about his activism, and the work of his peers. Ian Campeau, founding member of A Tribe Called Red, is another participant of the portrait series. All fifteen portraits can be seen in Kensignton Market for the month of May. This month-long display of Indigenous persons will run until May 31 as part of the Scotiabank Contact Photography Festival. For those wishing to attend the free exhibition, the location of these images spanning 32 windows can be located on Photographer Without Borders’ website. The PWB and Redworks photo exhibit is taking place throughout the month of May in Toronto's Kensington Market. Join us in the market May 27th for an educational and to experience Nadya Kwandibens's portraits in person.